When we first started having kids, my husband, Mark, was sometimes critical of me. It seemed as though every week his criticism would change, and I always felt as if I were failing to meet his expectations. We could not resolve our problem on our own and invested in married counseling. It was one of the best investments we have made, and I highly recommend it. Our counselor was able to identify objectively clear solutions to our problem. We needed to be realistic about our needs and expectations. The counselor was able to drill down for both of us what was really important for Mark. She had him rank all the things he had asked of me over the years. Then she asked, if there was just one thing I could execute well for him during this busy season of young children, what would it be? And if I promised to do it well, could he be content? He chose physical intimacy, regularly and often. She asked me to commit to that as his standard and I did. Then she asked him to let go of everything else and to be grateful to have that. Physical intimacy is Mark’s love language. So I started giving him more of that, and it worked. He was able to let other things go. It is not easy to understand your spouse. Becoming one is an ongoing process. I needed to know Mark’s priority, and Mark needed to understand my limitations. In this list you will find six things you must know to better understand your husband. What is his love language? Gary Chapman’s classic book The 5 Love Languages: The Secret to Love That Lasts explains how we receive and “hear” love in different ways: receiving gifts, quality time, words of affirmation, acts of service, and physical touch. Which of these say, “I love you” to him the most? And remember that he may be using the same style to communicate his love to you without realizing you may “hear” it differently. Perhaps he is telling you he loves you in ways you miss. What is his biggest dream? In his book Wild at Heart, John Eldridge says every man wants an adventure to live. What is your husband’s? Does he long to start his own business or scale the highest peak on every continent? Has he buried his deepest desires in the duty of everyday responsibilities? Are there some ways you can help reawaken or encourage him in reaching for a brave goal that will stretch his faith? Has your husband buried his deepest desires in the duty of everyday responsibilities? What spells romance for him? Anything that ends up with physical intimacy, you may be thinking. That’s certainly an element, most likely, but men like to be pursued, too. When you turn the tables and do the pursuing, it can make him feel that he has still got it. Initiating says that you are not just willing to respond to his advances but want to make your own. When did you last make plans and invite him out on a date? What does he enjoy doing? How does he like to spend time when he’s not fulfilling responsibilities at work or around the home or in the family? There is a good chance it will be activity-based, whether it’s working in the garage or cheering on a team. Do you help create room and time for his hobbies and interests, within reason, or do you view them as competition? Remember, when he is recharged, he has more to bring back to you. What makes him feel valued? In the movie The Intern, Robert DeNiro plays a seventy-year-old retiree applying for an internship. In his application video he says, “I just want to be needed again.” Guys need to know that they are needed, that their contribution is important, not just their paycheck. Do you thank him verbally? Leave him an appreciative note? What does he struggle with most in your marriage? While the area of your relationship that most concerns you is probably no secret to him, chances are he may not be so forthcoming about what bothers him. He may not want to rock the boat or risk conflict, or he truly may not even have thought about it. As far as he is concerned, everything is fine. But he may welcome an invitation to talk non-confrontationally about things. You could each ask each other what would help you enrich your marriage, opening the door for a deeper conversation. © 2017 Mark Merrill and Susan Merrill. 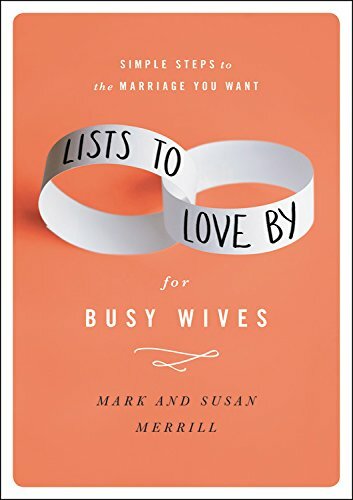 Taken from Lists to Love By for Busy Wives by Mark and Susan Merrill. Used with permission of FaithWords faithwords.com, a division of Hachette Book Group. To order the books, visit liststoloveby.com. For more relational resources, visit markmerrill.com and susanme.com.